BEES scientists are leading a major research expedition to the mid-Atlantic starting today. For more on the Venture Mission, see this BEES news item. â€¢Â Â Â The significant westward extension of the known area of active coral growth in the Porcupine Seabight. 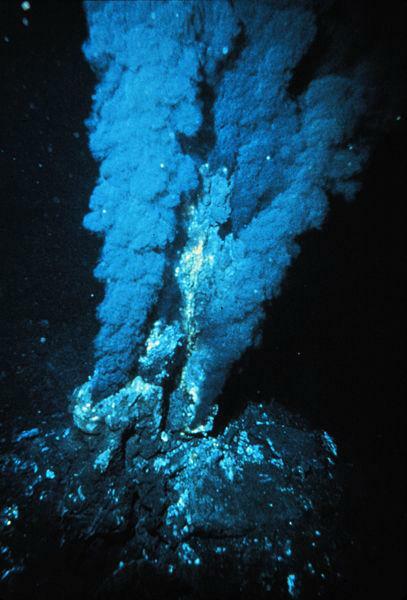 So, what are hydrothermal vents? Hydrothermal vents occur where cracks in the Earthâ€™s crust allow seawater to penetrate downwards into areas of subterranean volcanic activity. Here the seawater is not only heated to boiling point, but also permeated with dissolved minerals and suspended solids from the molten rock. This heated seawater then gushes back upwards into the ocean, giving rise to â€˜black smokersâ€™ and â€˜white smokersâ€™ â€“ similar in appearance to miniature erupting volcanoes. The â€˜45o North MAR hydrothermal vent fieldâ€™ being investigated by the mission, was first discovered in 2008 by scientists aboard the UK research vessel RRS James Cook through the pinpointing of a plume of heated water emanating from the seabed. The VENTure expedition will deploy the Remotely Operated Vehicle ROV Holland 1 to precisely locate the source of the heated water and then to film and sample around the hydrothermal vent field. Like their tropical counterparts, deepwater (or coldwater) corals are colonies of simple animals resembling sea anemones that secrete calcium carbonate to protect themselves, forming extensive and delicate reefs. Over millennia, these reefs build up to form â€˜carbonate moundsâ€™ on the seabed which can be detected using sound waves. Because their delicate nature makes coldwater coral reefs susceptible to damage from dredging or deepwater fishing, and because they form unique ecosystems offering shelter to a wide variety of marine life, many coldwater coral reefs around the Irish coast have been declared â€˜Special Areas of Conservation (SACs)â€™. The VENTure expedition will map the coral reefs on the western Moira Mounds and deploy the ROV Holland 1 to estimate the abundance and density of live coral. How are the scientists getting to the mid-Atlantic? â€¢Â Â Â The vessel is acoustically silent which minimises fish avoidance and provides an ideal environment for the collection of high quality acoustic data with minimal interference from vessel noise. â€¢Â Â Â The new vessel is a multipurpose vessel, being able to change from a survey programme to a fisheries programme, with relative ease. â€¢Â Â Â Large laboratory spaces and IT rooms fitted with scientific equipment. â€¢Â Â Â A full complement of survey equipment and winches. What is the Holland One? The Marine Instituteâ€™s Deepwater Remotely Operated Vehicle (ROV) Holland 1 was funded by the European Regional Development fund (ERDF). It is named after John Phillip Holland from Liscannor, Co. Clare, Ireland who was an early inventor and builder of submarines. 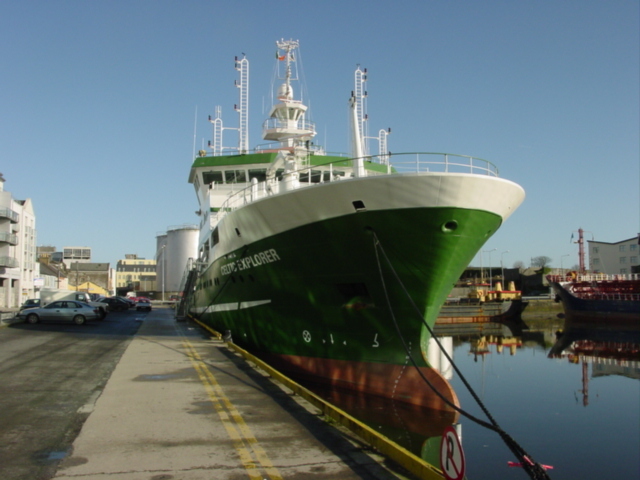 This 3000 metre rated system allows an expansion in the level of deepwater research undertaken by Irish researchers as well as being available as a national resource to state agencies in emergency situations such as casualty investigation, wreck surveys or salvage. The ROV system was designed and built by SMD Ltd (Newcastle, UK) and is designed to be capable of accommodating a wide range of user equipment without modification from the outset. Ample space is available within the vehicle frame for accommodation of scientific payload, numerous survey ports for a wide variety of equipment including multi-beam, CTD, nutrient sensors as well as numerous spare serial and I/O ports which have been incorporated into the system to allow a wide range of scientific sensors to be deployed. The vehicle is equipped with a high level of auto control features including auto hold which is invaluable in the completion of delicate scientific tasks. The vehicle is also equipped with the latest underwater camera equipment including a HDTV camera and recording system to allow the capture of high definition footage for a variety of uses.Â This will be augmented by a unique underwater lighting system being developed by the Irish company Cathx Ocean as part of a robotic â€œmachine visionâ€ system designed to significantly enhance image quality and to increase the autonomous function of remotely operated vehicles, thereby increasing efficiency and cost-effectiveness. The ROV Holland 1 is fully contained system including launch and recovery systems and whilst primarily designed to operate from the RV Celtic Explorer, is readily capable of mobilization from a range of suitable vessels as required. This entry was posted in Uncategorized and tagged Celtic Explorer, ecology, geology, marine, news, VENTURE, zoology. Bookmark the permalink.